Don’t think that just because it’s getting sunny out there that comics are gonna wait for you to get back from vacation. 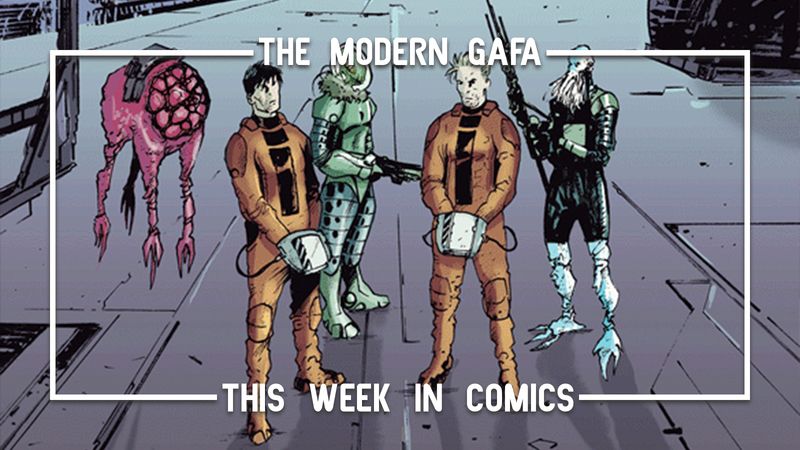 Another New Comic Book Day is upon us! Hit the jump to check out some of the new comics hitting the shelves at your local comic book shop this week. The Consortium offered unlimited energy in exchange for building Port of Earth. Since then there have been 3000 casualties from alien encounters and a massive hit to the global economy. And now there is talk of the Port being expanded - and the public is not happy. One of my favorite things about this series has been seeing the evolution of the relationship between our two protagonists. ESA Agents Rice and McIntyre are polar opposites. When we first met Rice he was a calm and collected young man and McIntyre had clearly signed up just so he can shoot aliens. I actively hated McIntyre at first. Here, after the loss of his fiance to their alien invaders, Rice has snapped and is going far out of their jurisdiction for revenge while McIntyre is just trying to convince him to go home. The two have completely flipped personalities and it’s working out really well. One of my favorite little things about Port of Earth is how each issue is framed around a TV interview that delves into the socioeconomic issues surrounding the Port and its effect on humanity. This issue, more than previous ones, spends more time on this as we finally raise the question: who is the Consortium? I have a feeling we’re about to find out. 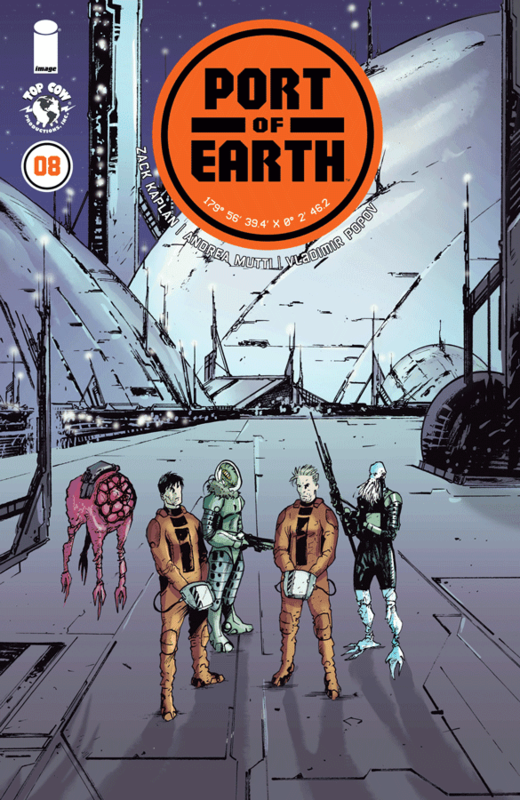 Port of Earth is one of my favorite sci-fi comics of the year. It’s imaginative and original and features a masterclass on writing dynamic, three-dimensional characters. I love learning about this world every month and I hope this journey never ends. The penultimate chapter in this tokusatsu comic adventure hits you with so much emotion as Yu gives everything he can to stop approximately four suicide missions. The Shrag have come to Earth and the only hope is the Suprarobo who needs one more Robo energy core to become fully operational. Yu’s rival, Olivia, pilots Yu’s Robo Buddy who wants to sacrifice himself for the fate of the world. Yu jumps in Olivia’s Hero Force to stop her and save both of them. Olivia and Buddy are both willing to give up their lives, but Yu is determined to find another way to defeat the Shrag. I’ve said this before, but the best aspect of this comic is the character of Yu and the “goodness” in his heart. He’s determined to save the planet but doesn’t want to have a single casualty - even though that’s what they’ve all trained for. I love this series so much and I can’t wait for the finale even if I don’t want it to end. It’s been a wild ride but it can’t go on forever. 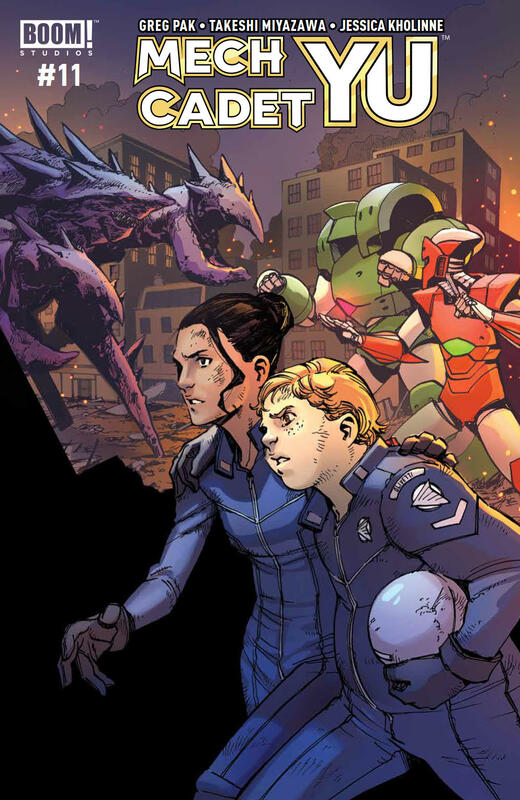 Look out for the final issue of Mech Cadet Yu next month. This special giant-sized issue includes an extended story by Nicole Andelfinger and Maddi Gonzalez and an extra short story by Brittney Williams. The main story is about a camp-wide dance with a contest for the best-decorated cabin. Naturally, Roanoke Cabin is going all out - or at least they're trying to. Everyone is arguing about what the most important part is. April wants to have the best decorations and theme, but Mal wants to have the best couples costume with Molly - but she hasn’t even bothered to ask Molly what she wants to do. On top of all that, faeries are stealing their party supplies. Don’t you hate when that happens? This story does a wonderful job of showing everyone’s competitive side. They all want to win Best in Show, but they can’t agree on whether costumes are more important than decorations let alone agree on what theme to go with. In the end, it’s the usually non-confrontational Molly who snaps everyone together. The extra story is short and sweet and begins beautifully in media res. Ripley has cannonballed into a pond and hasn’t come back. Everyone has some crazy theories about where she went, but Jo solves the mystery with the power of science! Both of these stories have some really great art too. I love the way the faeries glow like the ones in some Legend of Zelda games and seem to fly from panel to panel. Both stories have very small casts too. With no side characters getting in the way, the main cast is given the chance to interact and show off their great group dynamic. 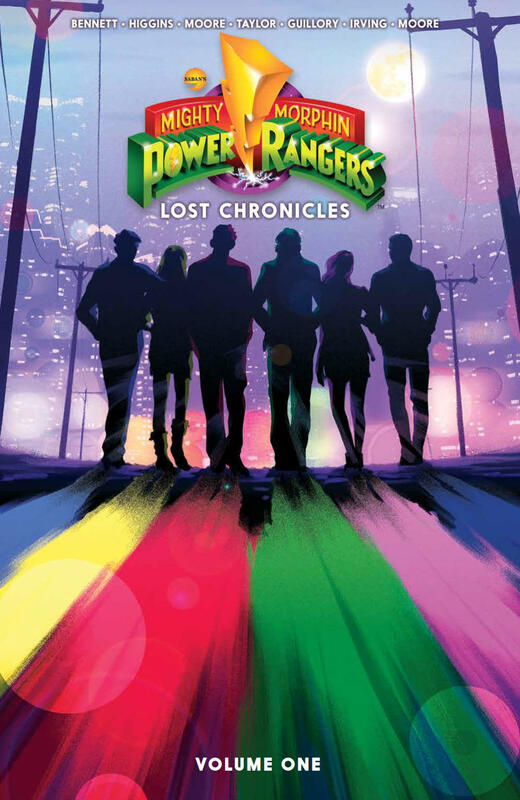 This is a collection of the stories originally published in the 2016 and 2017 Annuals for a total of twelves stories that add some more development and backstory to the characters and lore of the Power Rangers comics multiverse. While Kyle Higgins, the writer on the main MMPR comic, does contribute one story to each of the annuals, the remaining entries are all from different creative teams. This results in a diverse collection of stories that look and feel very different. The stand out stories from these two collections includes “Perfect” by Trey Moore, which delves into the origins of Rita’s monster maker Finster. “Only the Strong,” also by Moore, is a fan favorite that explores the secret origins of Goldar. Another is “Forever Mighty Morphin Black” which pulls familiar and unknown versions of Zack and Adam together for one epic team up. And then there’s “Search Party” by Higgins, which sees the moment where our alternate dimension Tommy makes the turn to the dark side and becomes Lord Drakkon. Beyond those lore-busters, there are plenty of slice of life stories that just set out to be creative and have fun with the Power Rangers sandbox. 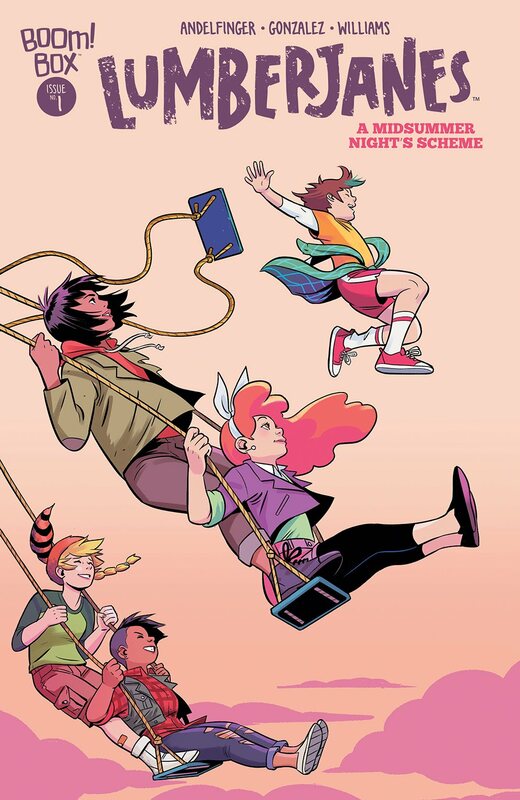 Another one to keep an eye on is “A Spot of Trouble” by Marguerite Bennett who will replace Higgins as head writer on the main series after Shattered Grid. These side stories are a lot of fun really add a lot to our understanding of what Power Rangers is beyond the typical stories the show gives us and even beyond the main comics. This first collection is available in comic shops this week and will be available everywhere books are sold after that. Click here to pre-order your copy today.